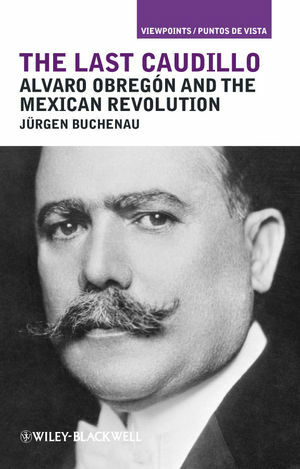 The Last Caudillo presents a brief biography of the life and times of General Alvaro Obregón, along with new insights into the Mexican Revolution and authoritarian rule in Latin America. Jürgen Buchenau is Professor of History and Latin American Studies at University of North Carolina, Charlotte, where he is Chair of the History Department. He is the author or editor of several books on modern Latin American history, including Plutarco Elías Calles and the Mexican Revolution (2007), Tools of Progress: A German Merchant Family in Mexico City, 1865-Present (2004), and In the Shadow of the Giant: The Making of Mexico’s Central America Policy (1996). 1. The Background of the Last Caudillo. From Santa Anna to Díaz. 2. An Improvised Leader, 1880–1913. Obregón and the Beginning of the Mexican Revolution. 3. Chaos and Triumph, 1913–1916. Obregón and the War Against Huerta. Obregón and the Clash Between Carranza and Villa. Obregón in the War Between the Factions. 4. The Path to Power, 1916–1920. Obregón’s Emergence as a Political Leader. The Cincinnatus of the West (Part One). The Campaign for the Presidency. The Construction of Obregón’s Political Machine. The Violent Breakup of the Sonoran Alliance. 6. The Last Caudillo, 1924–1928. The Cincinnatus of the West (Part Two). The Death of the Caudillo. An Arm and a Revolution on a Stage. A Revolution and a Leader Lose Respect.